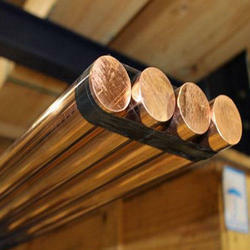 Our range of products include crzrcu round bar. Chromium Zirconium Copper CrZrCu - UNS.C18150 Chromium Zirconium Copper C18150 is an excellent and unique copper alloy with high electrical conductivity, hardness, and ductility, moderate strength, and excellent resistance to softening at elevated temperatures. The addition of 0.1% zirconium (Zr) and 1.0% chromium (Cr) to copper results in a heat treatable alloy which may be solution treated and subsequently aged to produce these desirable properties.